Turbo is formulated to include cereal grains and therefore provides ‘fast-releasing’ energy. This highly innovative muesli blend is the ultimate high performance feed, with 35% more digestible energy per kg than quality oats. It consists of cooked High-Oil Oat Flakes and cooked Full-Fat Soya Flakes, with added limestone and salt. Turbo is designed to be added to a TopSpec feed balancer or supplement and therefore contains no added vitamins or trace-elements. 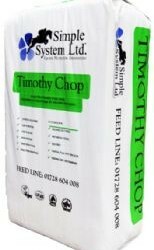 That is why we call it a ‘blend’, because it is a blend of straight raw materials rather than a complete feed. 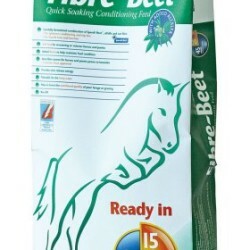 One of the ways in which it is superior to most straights however, is that it has been supplemented with the major minerals calcium and sodium. 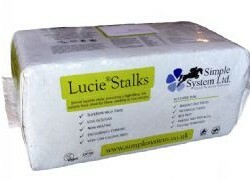 For example feeding TopSpec Turbo instead of oats, to hard working horses reduces or eliminates the need to add salt. Rich in intracellular oil, and with no added liquid oil, the sweetened ‘non-greasy’ flakes are very palatable to optimize feed intake at peak performance levels. Fed at 7kg/day, Turbo provides the equivalent of 750ml of Soya oil, eliminating the need for additional liquid oil. 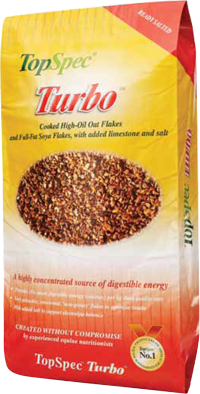 Turbo has been formulated to replace traditional cereals e.g. oats or the energy and protein component of ordinary cerealbased cubes/mixes where additional stamina or performance is required. When fed with TopSpec Racing Feed Balancer, it forms a complete, nutrient-dense feed for horses performing at the highest levels.